A polyline is an open or closed sequence of connected line and/or arc segments, which are treated as a single entity. Each segment of a polyline can have a width that is either constant or tapers over the length of the segment. The Pline command interactively creates open and closed polylines entering points. The Boundary and - Boundary commands create closed polylines from an enclosed area, defined by other entities. The THICKNESS system variable specifies the height of a polyline. If THICKNESS = 0 (zero) there is no visual difference between polylines and a series of lines and/or arcs. When a polyline is edited, you can modify the entire polyline or change individual segments and you can add or remove vertices. When Fill Mode is turned OFF, all filled entities, such as wide polylines and planes, display and print as outlines. Depending on the value of the GRIPS system variable have grips on their endpoints and vertices and/or at the midpoint of each segment. Click the Polyline tool button ( ) on the Draw toolbar. Choose Polyline in the Draw menu. Type pline in the command bar, then press Enter. Type PL in the command bar, then press Enter. 2. Specify the start point of the polyline. 3. Specify the second point of the polyline. 4. (option) Repeat step 3 to add more straight segments. Type A , then press Enter. Choose Draw arcs in the prompt menu. An arc segment displays dynamically. The arc is tangent to the previous line segment. 6. Specify the endpoint of the arc. 7. (option) Repeat step 6 to add more arc segments. Type L , then press Enter. Choose Draw lines in the prompt menu. 9. Specify the endpoint of the line segment. 10. Right click or choose Done in the prompt menu to stop. 11. (option) Right click to restart. Click the Boundary Polyline tool button ( ) on the Draw toolbar. 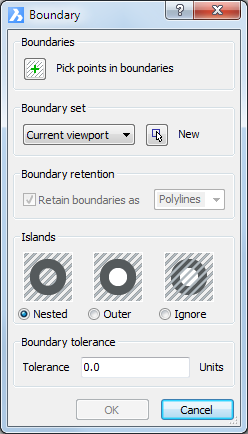 Choose Boundary Polyline in the Draw menu. Type boundary in the command bar, then press Enter. The Boundary dialog box opens. Select the boundary entities in the drawing, then Press Enter. 3. Click the Pick points in boundaries button on the Boundary dialog box. 4. Click in the area where you want to create the boundary polyline: point 1 in the image below. 5. The boundary polyline displays in dashed lines. 6. (option) Keep picking points to create more boundary polylines. 7. Right click to accept the polyline(s). The Boundary dialog box opens again. 8.Click the OK button on the Boundary dialog box. The polyline(s) is (are) created. If you select the boundary entities before launching the Boundary Polyline tool, you can make the selection set active by pressing the Select button ( ) in step 2. If you type -boundary (don't forget the "minus" sign) in the command bar, you are prompted to click the area where you want to create the polyline(s) immediately (no dialog opens) then right click to create the polyline(s).